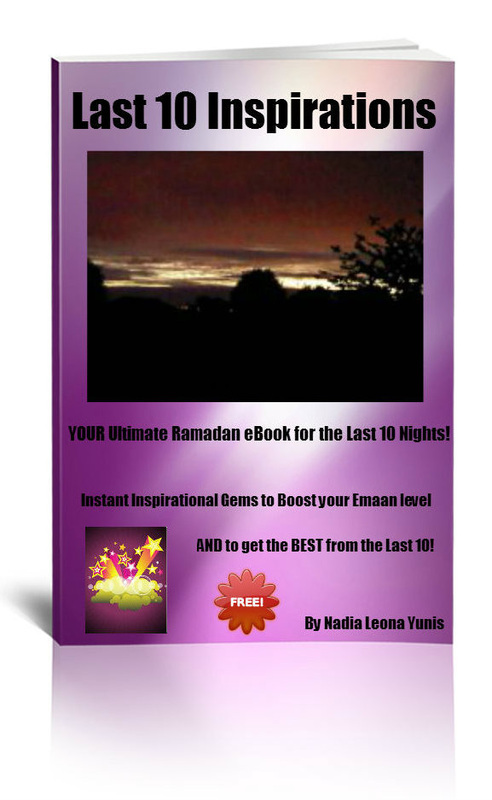 2nd Edition NOW available with the BONUS chapter; 'How to Create your own Spiritual Retreat!'. Pop your email below and get your *FREE* copy NOW! Give me my *FREE* eBook NOW! Ps - If you want a spiritual high all year round or want to create your own spiritual retreat any time of the year then THIS eBook is for YOU! Pray my email finds the 'We Be Inspired' team in the best of health and imaan and that you are enjoying (& making the most of) the last few days of this blessed month! I just wanted to email you to say jazaak allah khairun for the updates you have been sending. This year, unfortunately I haven't focussed as much as I could have done re prayers/duas/reading the quran and your emails have been really inspiring and have motivated me to get myself into gear and get my ibaadah sorted. As you are quite right the "Angel of Death isn't going to text his arrival". May Allah swt bless and reward you all in the work that you are doing (& specially bless that Nadia Leona Yunis!!) i.a! Jazaakilah khairun for your 'We Be Inspired' emails. They have been very inspiring and helped me plan my last days of Ramadan. It is such a busy month that even though you plan ahead you can't anticipate all the things that will happen. I benefitted a lot and forwarded the emails to all my contacts. The emails were different and bite-size, just enough information each day and the tips at the end were very encouraging and I was able to implement them. I would recommend everyone to read these emails – especially in the last phase of Ramadan as I believe they can help us maximise our time and ibaadah. Last 10 Inspirations from We Be Inspired on Vimeo.